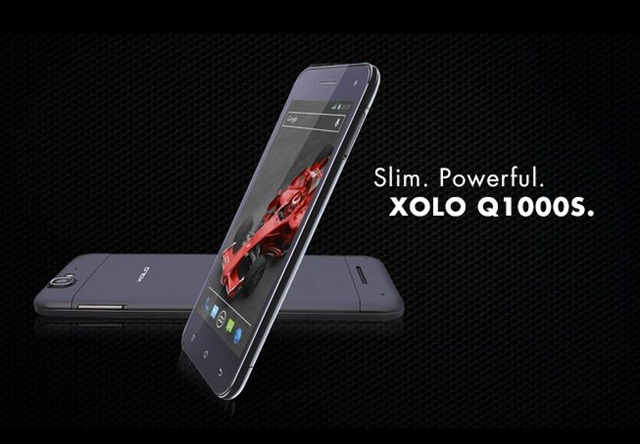 XOLO has finally unveiled and launched its Slim smartphone which it has been promoting through Facebook teasers this week. This phone is XOLO Q1000S Which was to be launched earlier last month and has now arrived with a slim and svelte body design of 6.98 mm thickness. This phone is powered by a 1.5 GHz Quad core processor and is backed by a 1 GB RAM capacity. The internal memory is quite impressive at 16 GB. This constitutes a pretty good chipset which will provide for smooth UI transitions and efficient Multitasking. The Display of this device is 5 inch HD. These days many manufacturers are moving towards larger displays and pushing their phones towards the phablet category, but XOLO is sticking to the 5 Inch range for now. This display will give you a pixel density of 294 ppi which constitutes a pretty good display. The camera features are pretty good. This device boasts of a 13 MP primary camera with BSI 2 Sensor. This camera is capable of recording Full HD 1080p videos and can capture clear images even when the camera is shaking using the image stabilization technology. It can capture 99 shots with its Burst mode feature. The front camera of 5 MP too comes with a BSI sensor which is some ting new. Manufacturers just don’t seem to care enough for the front camera otherwise which is seldom used. The battery backup is pretty good at 2500 mAh and will easily carry you through the day with moderate usage. It offers stand by time of up to 425 hours on 3G and up to 327 hours on 2G, talk time of up to 22.5 hours on 2G and up to 12.5 hours on 3G. XOLO Q1000S has been launched for Rs. 18,999 and will compete with recently launched Micromax Canvas Doodle 2 and Canvas 4. XOLO has provided with admirable features including camera specifications and copious battery backup.